Le Bret and Ragueneau stare at Cyrano, shocked to see their friend in so much pain and suffering. They tell Roxane the truth: Cyrano was attacked that same day. Cyrano nods and takes off his hat, revealing the enormous bandage on his head. Le Bret and Ragueneau weep for their old friend. It’s now clear that Cyrano is revealing his feelings for Roxane because he knows he has nothing to lose. He’s going to die soon, but he still can only hint at the truth in the most convoluted way. This moment is tragic in an especially complicated way for Roxane. Cyrano turns to Roxane and tells her the truth: on the night that Christian appeared outside Roxane’s window, it was he who wooed her from underneath the balcony. He knew he could never win Roxane himself, since his face was too ugly. His entire life, Cyrano explains, his voice getting fainter and fainter, he’s been searching for love. Now that he’s going to die, Cyrano will be able to converse with his heroes—people like Galileo and Socrates—even if he won’t be with Roxane, the love of his life. In this ironic, paradoxical monologue, Cyrano establishes a new definition of love. The love he’d spoken of before was eternal, Platonic, and unwavering. Here, he expresses a kind of love that doesn’t last forever: a love that he was brave enough to reveal only in his final moments of life. His love for Roxane was real, and her love for the Christian-that-was-Cyrano was real, but their love for each other never had a chance to become its own entity—it only exists in this fleeting moment before Cyrano dies. Cyrano, falling to the ground, tells Roxane that he wants her to mourn him at the same time that she mourns Christian. Roxane nods tearfully, promising to remember Cyrano forever. 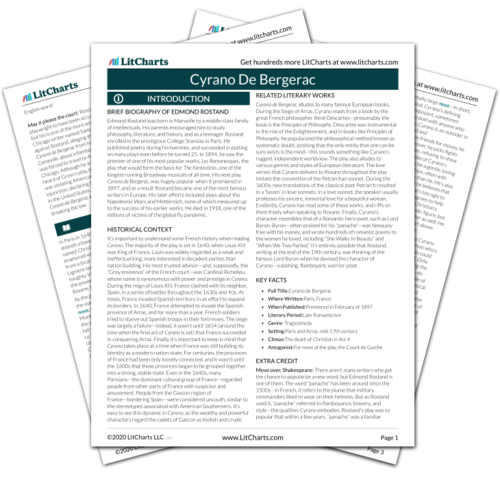 Cyrano’s desire to be remembered forever is entirely consonant with Cyrano’s flamboyance, extravagance, and “panache.” He’s spent his entire life performing big, theatrical gestures that are designed to be enjoyed, talked about, and above all, remembered. Tellingly, we never get Roxane’s real reaction to the truth—she only promises to mourn Cyrano as she mourns Christian. The “test” of whether or not her love was truly Platonic ends just it begins, and she never has a chance to process everything and decide (within the play’s action) whether or not it was only Cyrano she loved this whole time—or to face the crushing realization that the man she has spent fifteen years mourning never really existed at all. Suddenly, Cyrano jumps up from the ground, drawing his sword and vowing never to surrender to death without a fight. Roxane, Ragueneau, and Le Bret are extremely surprised. Cyrano boasts that, in spite of his ugly appearance, he has one thing that no one else has—one thing he’ll take with him to heaven when he dies today. With these words, he falls to the ground again, into the arms of Le Bret and Ragueneau. Rostand brings his play to a close in high Romantic fashion. Cyrano has spent his life fighting the people around him—a lifestyle that eventually gets him killed. And yet there’s something extremely noble and impressive about Cyrano’s behavior: he’s so energetic and spirited that he refuses to give in to anything, even death. Cyrano’s life is meteoric: bright and impressive, but short. And yet the legend of Cyrano will live on forever. Above all else, Cyrano will be remembered for his flamboyance, his cleverness, and his daring—in short, his panache. Since Rostand’s play, the word “panache” has become common in the English language—in a way, then, Cyrano’s panache has become immortal, and he has indeed been remembered long after his death. Arn, Jackson. "Cyrano De Bergerac Act 5, Scene 6." LitCharts. LitCharts LLC, 21 Mar 2016. Web. 20 Apr 2019. Arn, Jackson. "Cyrano De Bergerac Act 5, Scene 6." LitCharts LLC, March 21, 2016. 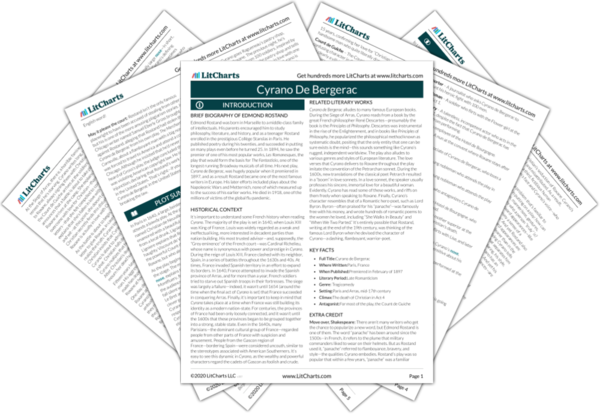 Retrieved April 20, 2019. https://www.litcharts.com/lit/cyrano-de-bergerac/act-5-scene-6.